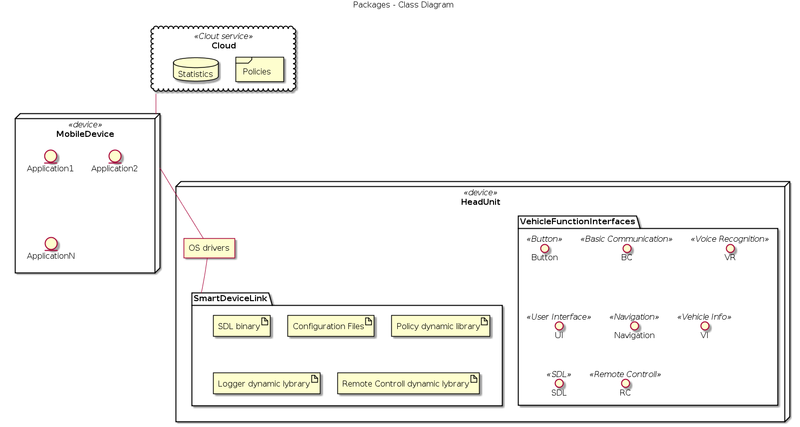 The SDL application model permits multiple applications to be concurrently active and connected to the HU. A few of those applications may interact with the user at a time using the HMI (depending on HMI). SDL uses the concept of HMI Levels to describe the current state of the application with regards to the level at which the head unit can communicate with it (and vice versa). Sends statistics to Cloud Server. HU HMI allows the user/driver to interact with the vehicle. The HU HMI Handler interfaces with SDL Core to support the API functionality. What interfaces application is allowed to use. Sends policies updates to Mobile Device. Receives statistics from Mobile Device.